WALKING TREE, INC. P.O. 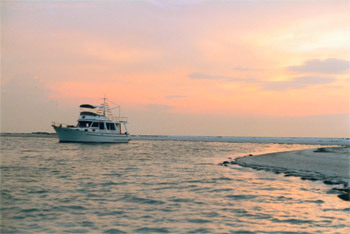 BOX 468, CRYSTAL BEACH, FLORIDA 34681 U.S.A.
we began receiving requests to teach, speak to interested groups, and hold seminars & workshops. 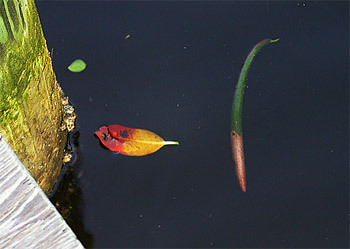 In response, we are excited to share our on-line workshop entitled – Your "LIFE BLENDING Message"
About Us… Walking Tree, Inc.
Red Mangrove leaf & seedling floating by our dock at Happy Bayou. in a positive, joyful and uplifting way!" WALKING TREE, INC.: The name emerged naturally – from Hal and B.J. 's fascination with the beloved Red Mangrove– "the tree that walks" by extending its prop roots… see Hal's painting of "Mangrove Momma" below. your leaves and seeds are a source of food. Mangrove Momma, I'm talking about you." 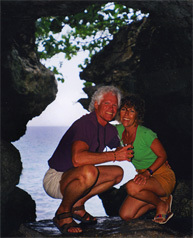 Walking Tree, Inc. was established in 1980 to represent Hal Stowers and his art. 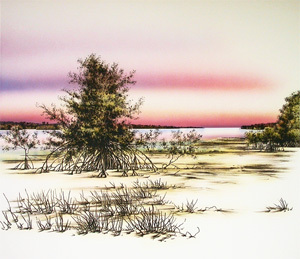 For three decades the corporation has published, curated, exhibited and sold this Florida Environmental Artist's limited edition etchings and original lithographs, as well as one-of-a-kind watercolors, canvases, monotypes and mixed media work. Walking Tree offers the work of Hal Stowers through three websites and by private appointments – and represents the Artist in his aesthetic consulting and commissioned works including large scale, indoor/outdoor environmental sculpture. P.O. Box 950, Palm Harbor FL 34682, U.S.A.
LIFE BLENDING is the Registered Trademark of WALKING TREE, INC.
unless otherwise credited. All rights reserved. Published by WALKING TREE, INC.